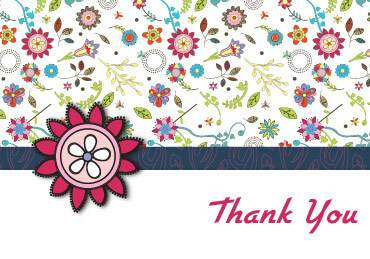 Here are two more free printable thank you cards. I've used a retro pattern and retro fonts that I found on the web. I created two similar cards, mainly because I couldn't decide which one I liked best! I'll leave that decision to you. I have included a number of options in PDF format. See below for the options. The lovely floral pattern I've used is by Designious. 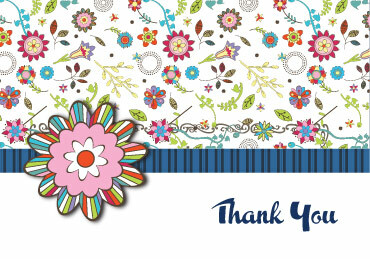 Please take a look at my other online thank you cards and printable free greeting cards. Before you print the card, please check my Downloading and Printing Tips. Click on one of the images or links above to open the image in a browser then right click the image and choose "save file as...". If you wish to have a higher quality image, download one of the PDFs below. I have created a number of options for the PDF version. All versions are designed for US letter-sized paper (8.5 x 11 in), but can be resized to print on a different size if you wish.